Clwyd Theatr Cymru. New Theatre, Cardiff. For a play first premièred in the spring of 1953, Dylan Thomas' 'infernally eternally unfinished' masterpiece still springs forth with all the uncircumcised roaring pain and joy of a new born. Covering 24 hours in the life of the (then) obscure Welsh fishing village of Laugharne, the cast consists of amorous teenage girls, randy, 'Thin Welsh beer' swilling men, a retired and blind Fisherman and the village itself amongst others. 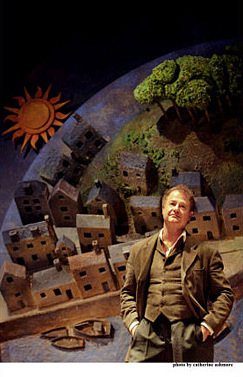 The narrator – played here with a benign, amused authority by Owen Teale – weaved the whole giddy chorus together. This was the first night and the cast were patently revelling in both the audience's exigent appreciation and the work itself. After the interval everyone had obviously realised that said audience was conquered. The last hour was a joy for both those on-stage and off with the cast movingly appreciative of each other, sometimes pausing to hold back laughter much to the delight of the full house. The work itself assumes a musicality without ever lapsing into a musical. There are few songs – one sung with a supernatural beauty (over the twittering mobile phone of an audience member) by Carl Morgan - but its the joyous language itself served sublimely by the pitch perfect cast that carried the night along. The set by Marty Baibridge -subtle but sure lighting, a model of the village itself suspended in heaven above the stage - is both powerful and unassuming. Two hours seemed like 30 minutes. I left feeling I had come from a place that was real, mythic and timeless. For this reason, the production reminded me of 'The Wizard of Oz'. 'Under Milk wood' – a place of old and young, day and night, light and dark but ultimately - only of life itself.